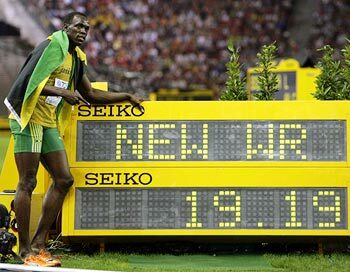 Jamaica's triple Olympic champion Usain Bolt tore his own 200 metres world record to shreds in Berlin on Thursday, clocking 19.19 seconds in the final to complete a breathtaking sprint double at the world championships. Bolt, a day short of his 23rd birthday, made the most of a fast start to take a massive 0.11 seconds out of the previous record he had set winning gold at the Beijing Olympics -- a year ago to the day. Panama's Alonso Edward was second with a time of 19.81 and American Wallace Spearmon was third as Bolt became the only man ever to hold the 100 and 200 Olympic and world titles as well as the world records at the same time. The top five sprinters all clocked under 20 seconds. 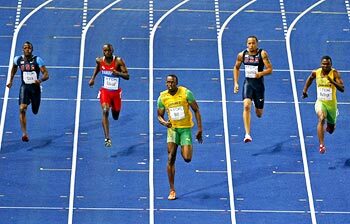 "Tonight I didn't expect this," said an elated Bolt, who also took 0.11 seconds out of his 100 metres record to win Sunday's final in a jaw-dropping 9.58 seconds. "I was definitely surprised -- I didn't know I was running that fast," he told reporters. "I did well for myself and I am on my way to becoming a legend so I am just happy. I keep telling you guys my aim is to become a legend." Asked how he would celebrate his victory and birthday he said: "I am going to get a really long sleep because I am really, really tired right now." Bolt, who has raced almost daily since the start of the championships last week, looked sluggish in the qualifying heats and had admitted the preparation for his favourite event was not as good as last year. He entered the stadium wearing, along with his trademark smile, a t-shirt that read "Ich bin ein Berlino," the name of the championship mascot, Berlin's bear. 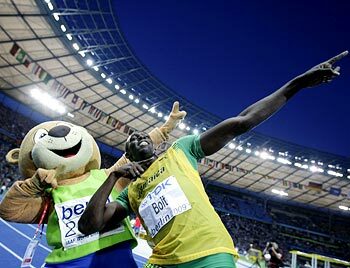 Bolt was unfazed by a false start triggered by Frenchman David Alerte and he played up to the cameras in his usual way. Once the starter's pistol went off, the Jamaican bolted from the blocks and within 20 metres he had grabbed the lead he would never relinquish. He raced down the straight well ahead of everyone else, with only the clock to beat. 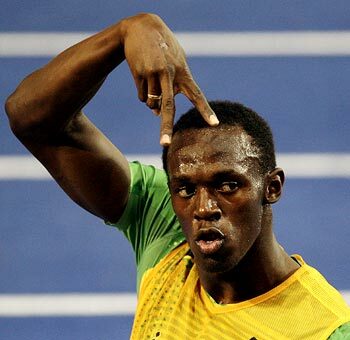 Working as hard as anyone had ever seen him in a major race, Bolt caught a glimpse of his time just at the finish line. Edward was caught in the first few metres but staged a stunning sprint down the straight to edge past Spearmon and claim silver. "I was just waiting for the lights to flash Game Over because I was in a video game," said fourth-placed Shawn Crawford of the United States. Bolt can improve on his gold medal tally with the 4x100m relay, another world record he helped set at the Olympics with Jamaica. "I am not thinking about a world record there. I just want to get the baton round and win," he said.